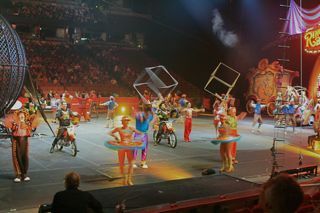 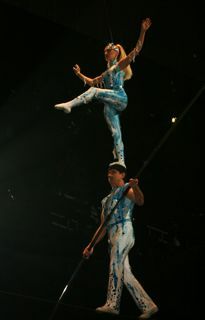 I was able to attend the Blue Unit Circus Performance at the Anaheim Honda Center, Anaheim, CA. I had perfect seats and took some photos that you might enjoy. Of course they are not as good as the official RBBB Circus photos on the first page of this report, but they were fun to take and share with you. 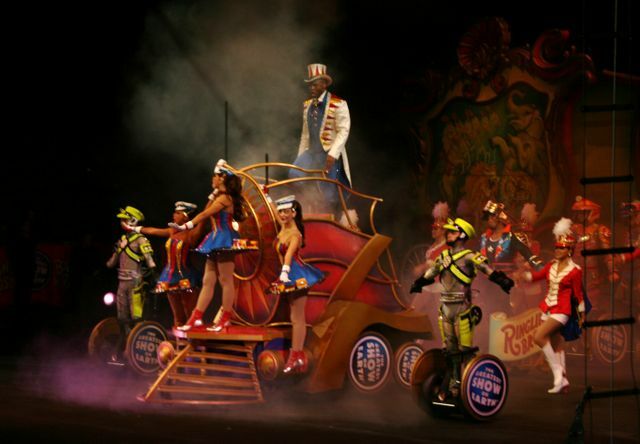 Outside the Arena, you can see the circus wagons that are carried on the flat cars of the Circus Train. 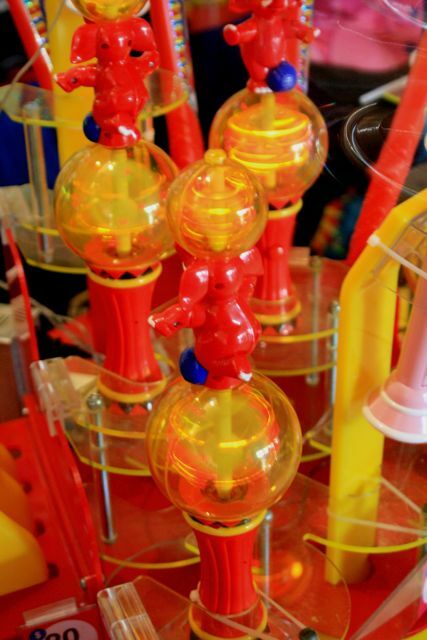 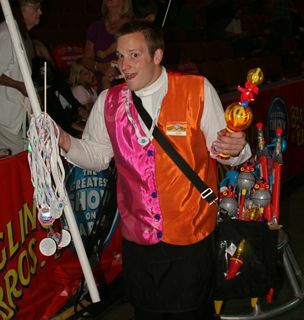 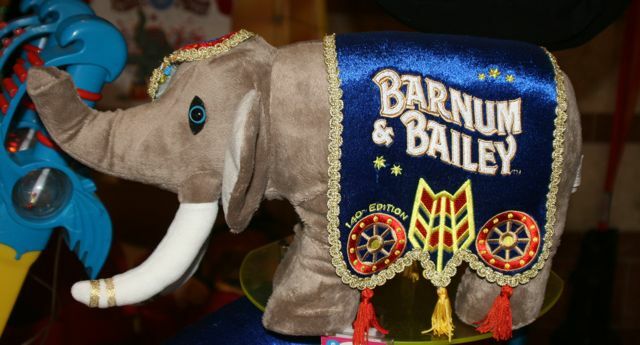 They are used to transport the many RBBB official souvenirs of the Circus. There is a large tent outside the arena with many of those souvenirs. 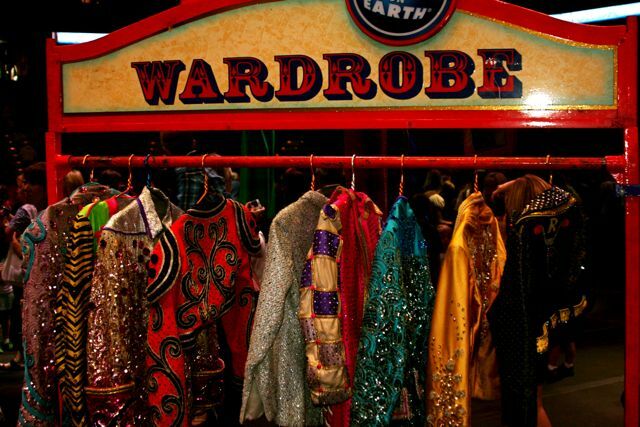 Arrive at least one hour before showtime. 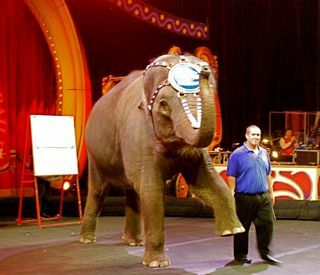 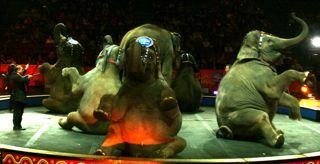 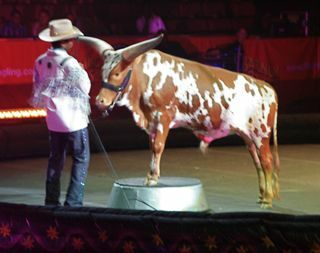 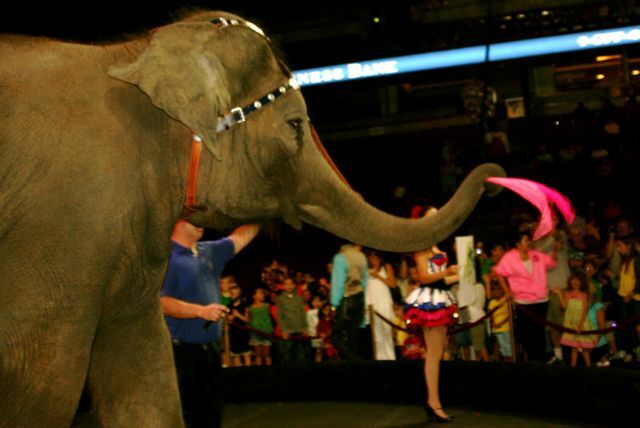 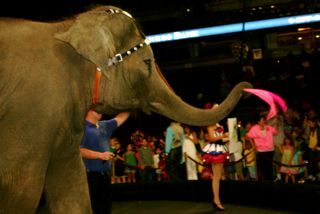 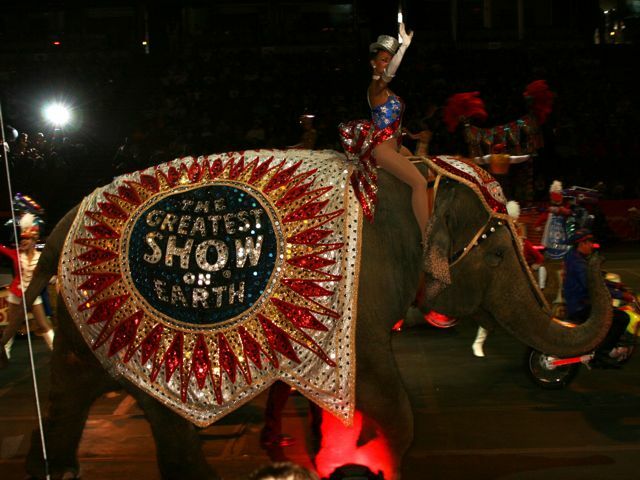 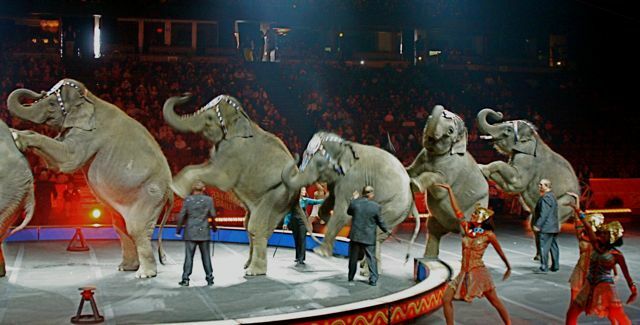 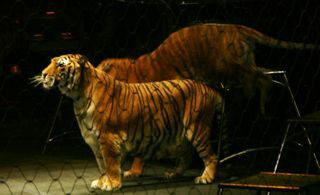 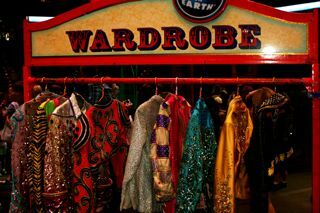 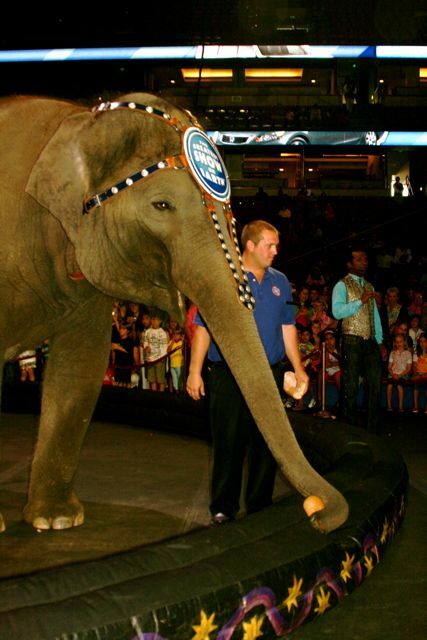 This gives you time to see the circus animals outside the arena and time to go inside, down on the arena floor for an up-close-and-personal visit with many of the entertainers as they help with various routines, sign autographs, and pose for close photographs. Places to have your photo taken. Another photo booth where you can dress up as a clown for your photo. Photos from the arena floor before the Circus begins. 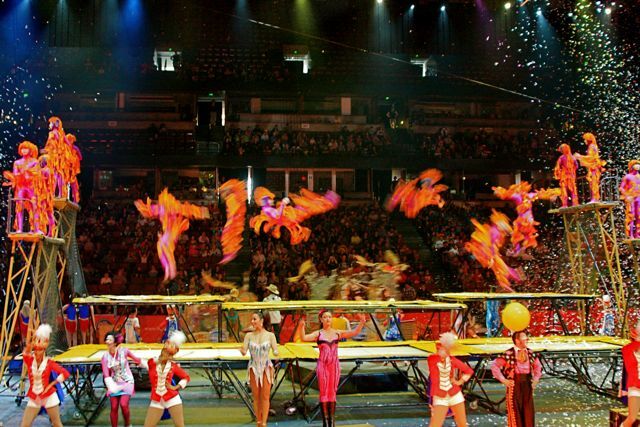 An hour before show time, audiences can join Ringling Bros.® talented performers and learn new circus skills at the All Access Pre-show, FREE with your ticket! 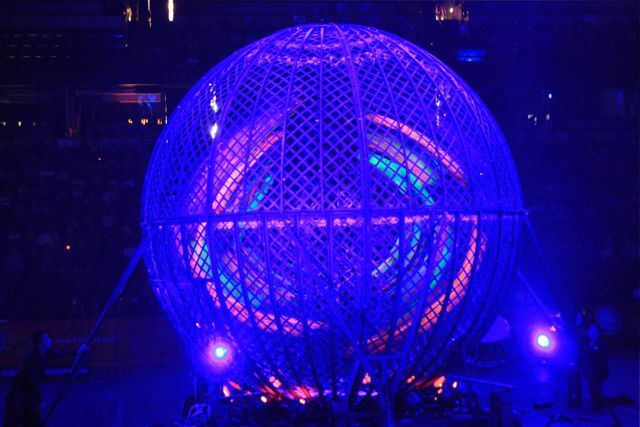 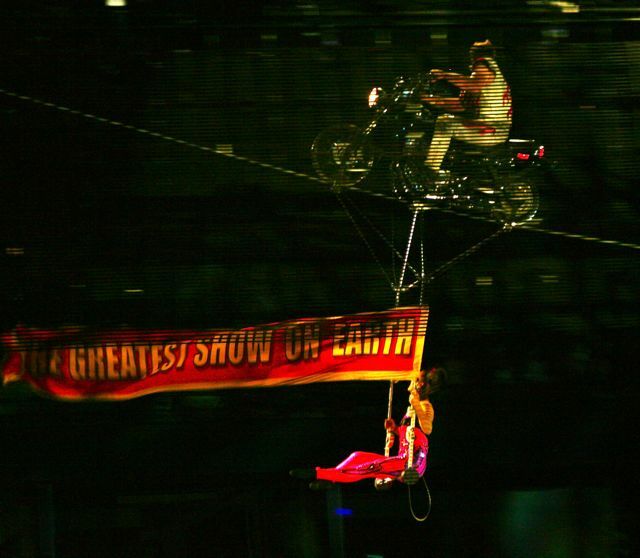 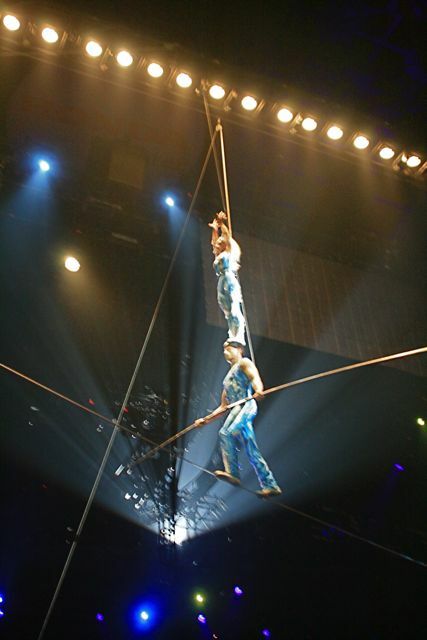 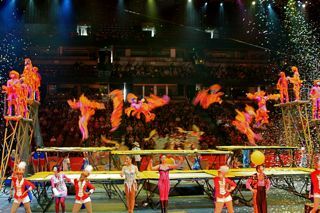 o At the Free All Access Pre-show, Ringling Bros. acrobats, clowns and other accomplished athletic performers show young and old alike an awe-inspiring and action-packed approach to daily health and fitness. 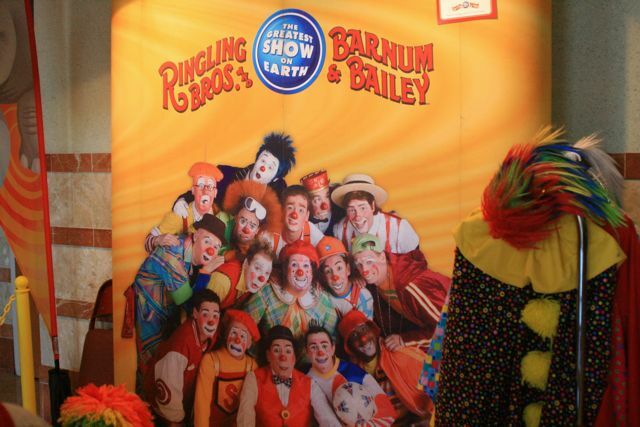 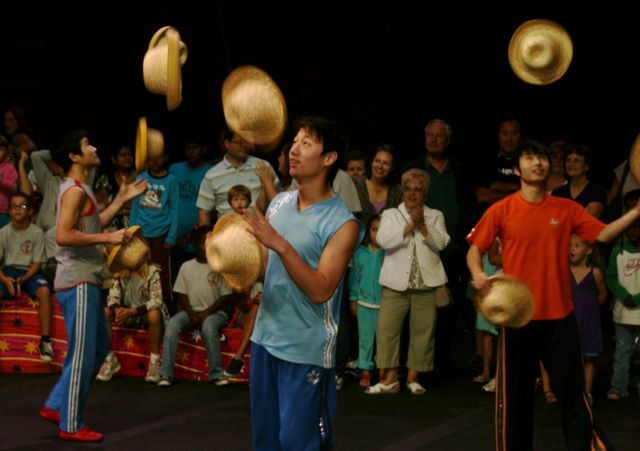 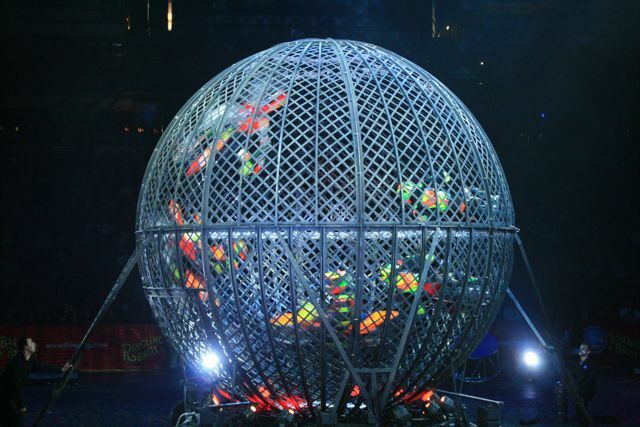 o Audience members can get up close and personal with Ringling Bros. performers to take photos, get autographs and learn circus skills at the All Access Pre-show. 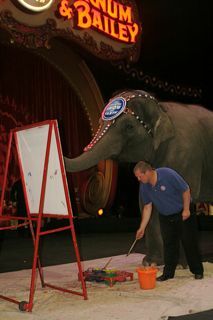 o Circus-goers can meet some of Ringling Bros. majestic animals, see a pachyderm paint a portrait and learn more about Ringling Bros. commitment to elephant conservation at the All Access Pre-show. 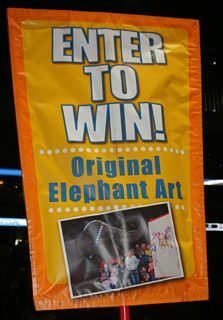 o The All Access Pre-show is the only place where you can register for a chance to win a masterpiece created by one of Ringling Bros. artistic Asian elephants. 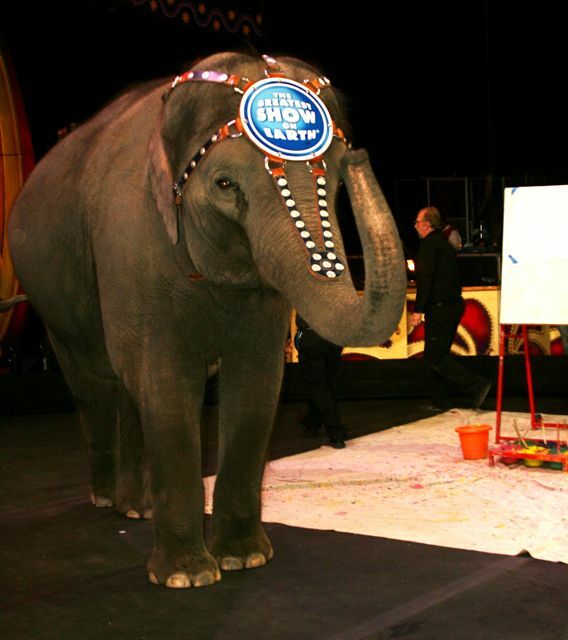 A chance to get close to an elephant, as she paints! Her treat for a nice painting is a giant loaf of bread. 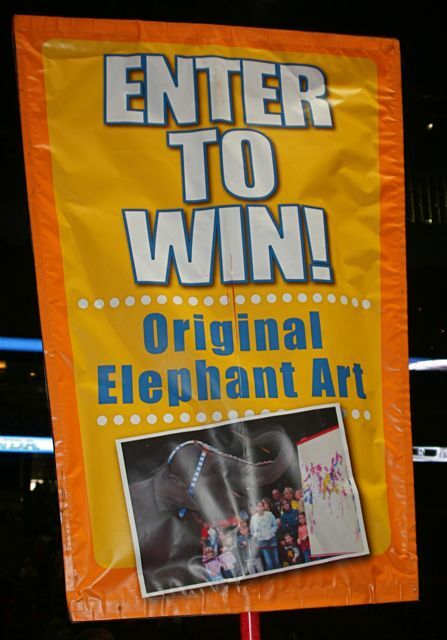 The final art piece, given away in a drawing. 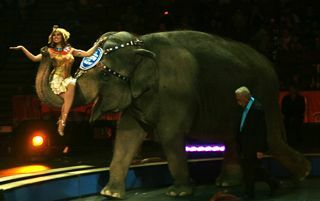 She responded to the audience's applause by waving a pink scarf. 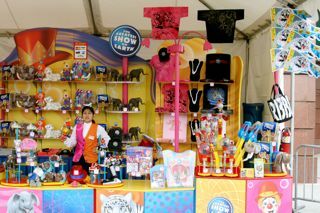 Even the vendors get into the act. Johnathan Lee Iverson was the first African American and the youngest Ringmaster in the history of Ringling Bros. and Barnum & Bailey®. 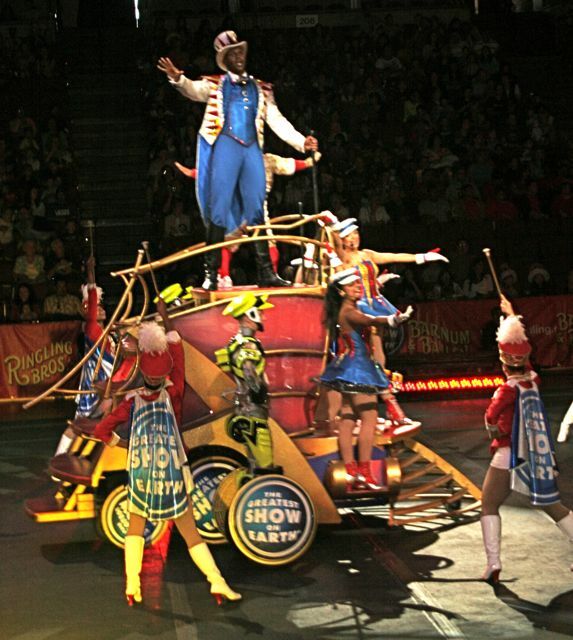 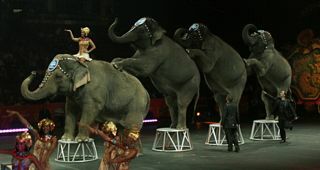 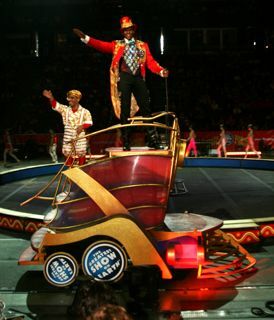 This edition of the Circus has two themes: The Circus Train (note the cart the ringmaster is riding on the left), and the 200th birthday celebration of B. T. Barnum (when they had horse-drawn circus wagons as above). Most of the performers and animals are in the Grand Parade at the beginning of the performance. 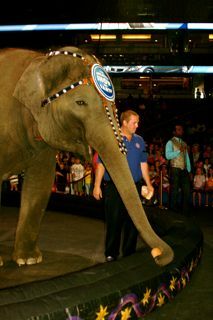 Daniel trains his four-legged partners for four years before they can join the act. 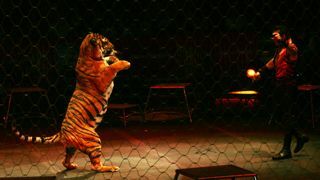 The tigers slowly get acclimated to the upbeat music, the constantly changing lights, and the non-stop action. 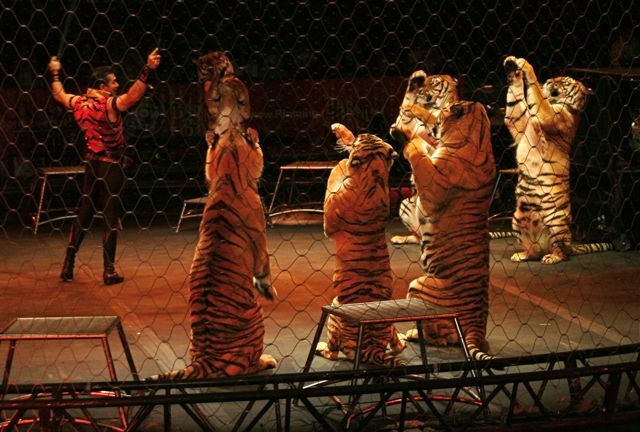 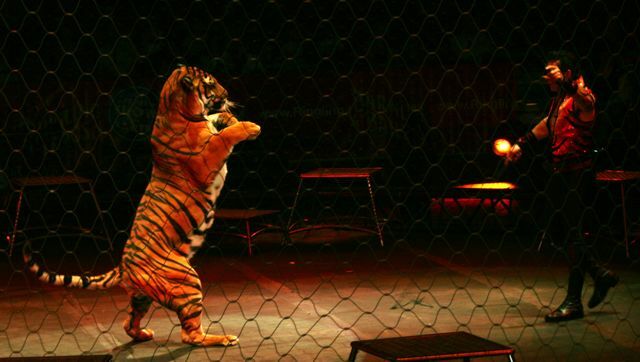 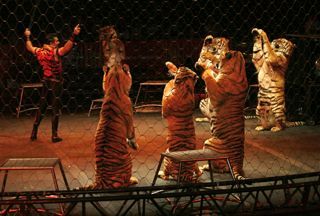 Daniel's act includes 11 feline cohorts including Siberian, Sumatra, and Bengal tigers. 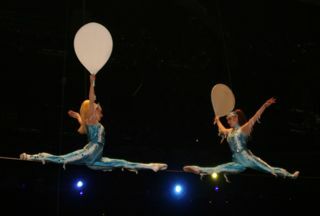 Both Virginia and Ihosvanys were gymnasts before they decided to expand their skills and attend Circus schools in their native countries of Argentina and Cuba. The troupe is led by creator and father, Sergey Makarov, and includes his two tremendously talented daughters Karina and Elina, and their high-wire walking husbands Sergey and Mikhail. 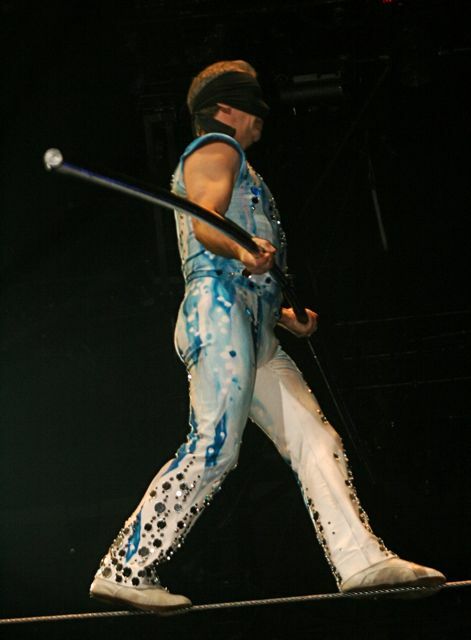 Yes, he has a blindfold on! 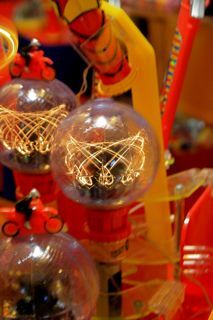 I like the lights in this photo. 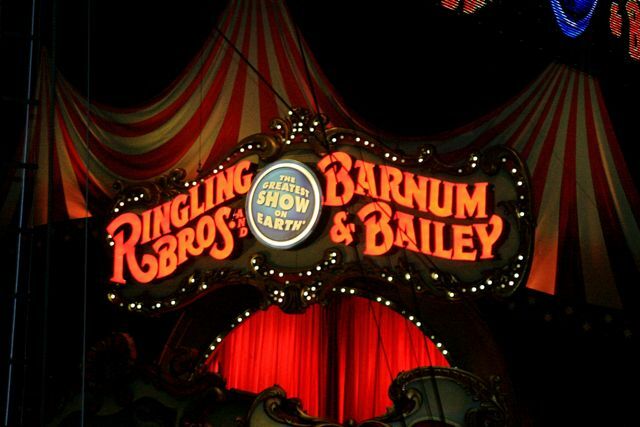 The new sheets of lights list the performers' names. They eventually got SEVEN motorcycles in this steel cage going every which way! 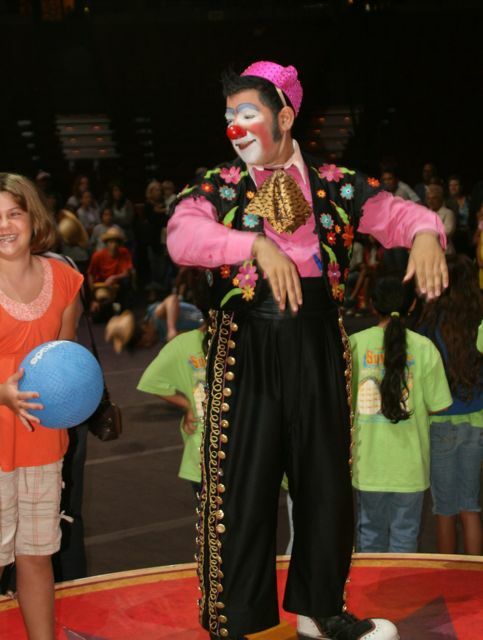 Coincidentally, the Torres Family is from Paraguay where our son is a Missionary. After about an hour of performing, they have another parade then an intermission, and the second hour show. As you can tell, elephants are my favorite circus act. 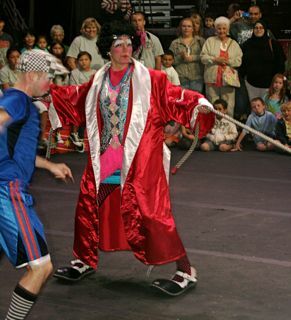 Before joining the circus, Paulo became skilled in the art of Capoeira, which is a combination of martial arts moves, dance moves and acrobatics, and is extremely popular in Brazil. 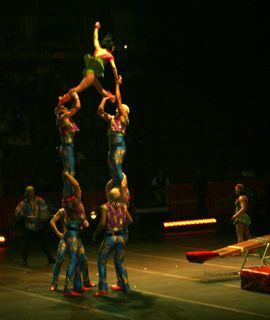 Many aspiring acrobatics train at the renown Puyang, China, Acrobatics School at a young age, and as a testament to the school’s success, more than eighty percent of the acrobats who perform all over the world, come from this training facility. 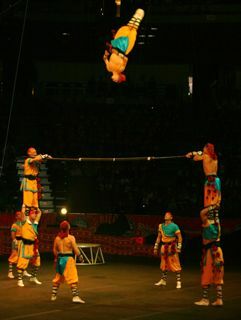 This troupe has 20 members. 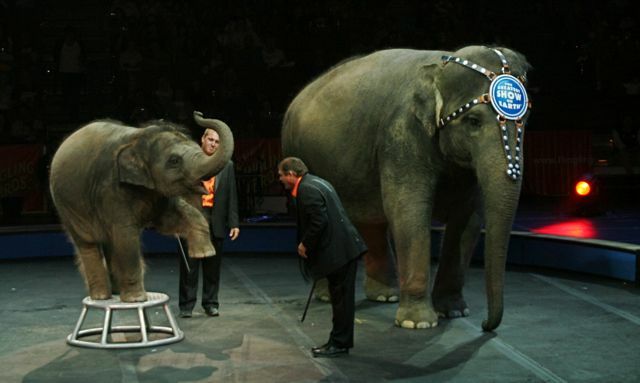 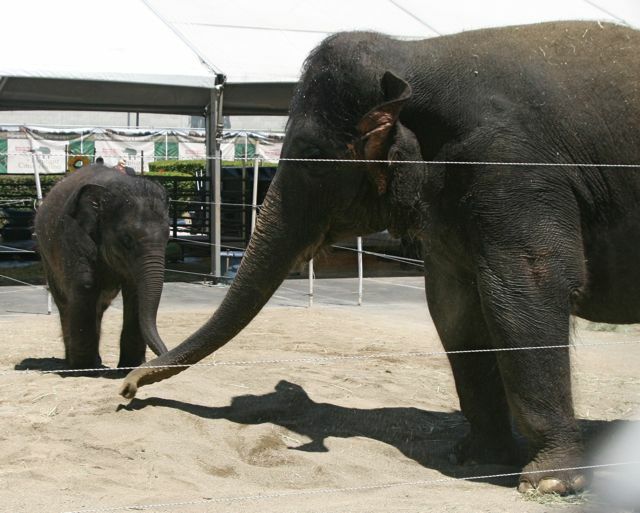 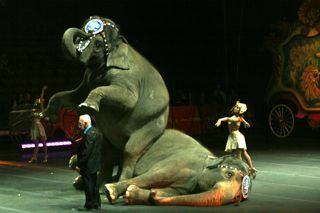 The finale is the presentation of Ringlings newest elephant baby, Barack, and his mother. 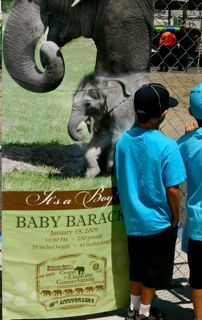 As you leave there is more information about Barack and Ringling's Center for Elephant Conservation where Barack was born Jan. 2009 at 250 pounds. 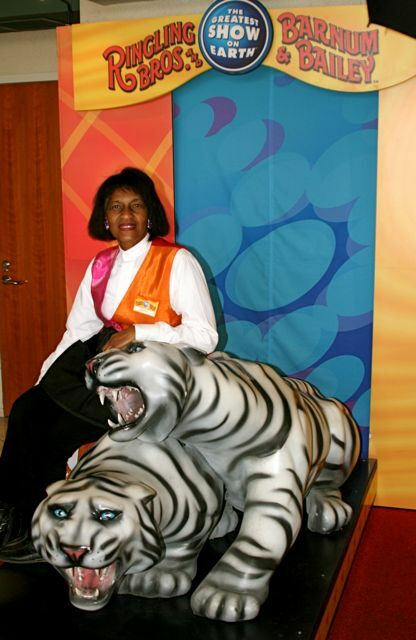 Barack and his Mother, out of costume, behind the scenes. 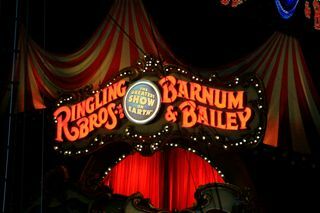 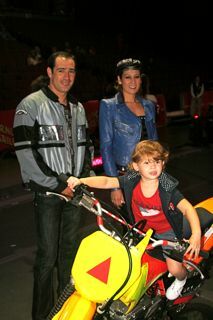 Another great, fun Ringling Bros. and Barnum & Baily Circus.